Huzin Rustem Faitovich was born in 1975 in the Ufa city (republic Bashkortostan, Russia). After nine classes of high school - study in the Penza art school of Savitsky. Since 1996 - study in the Russian academy of painting, sculpturing and architecture (Moscow). From an academy third year - training in a workshop of a portrait under the direction of professor Hasjanova L.S. After the academy termination in 2002 - training in creative masterful painting of the Russian academy of Arts under the direction of academician Jakupov H.A in Kazan (Russia). 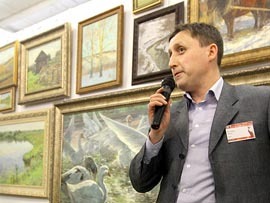 Since 2005 he is a member of the Union of Artists of the Russian Federation and the Union of Artists of Republic Tatarstan. Rustem Huzin - Ilya Glazunov's pupil, perhaps, it has received one of the best schools of painting in Europe. Now he lives and works in Kazan. Rustem Huzin full fill paintings to order. You can order landscape, still life or a portrait of your family. It will be the best present to you friends and relatives.